The rich, full flavor of slow-cooked food has been a staple of outdoor cookouts. The Masterbuilt 40-inch Extra Large Vertical Gas Smoker delivers smokehouse flavor as easy as grilling! 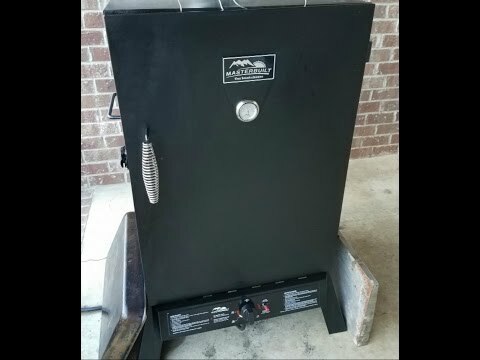 This gas smoker makes adding woods chips or water easy and with minimal heat loss allowing you to have as much or as little smoky flavor you would like for your foods. This extra large smoker has over 1,300 square inches of total cooking space on four chrome cooking racks. This smoker also has 15,400 BTU’s with a stainless steel burner. With its convenient, built-in temperature gauge right in the door, you will always know the temperature of your food while it still cooks. The locking door design helps to keep the heat and smoky flavor inside. The push-button ignition makes start up easy. Whether you’re cooking pork, chicken, beef or seafood, the delightfully smoky aroma that permeates from the Masterbuilt 40-inch Extra Large Vertical Gas Smoker has a way of making friends and family flock around the smoker in the spirit of good times and good food!Four chrome smoking racks and a stainless steel burner.